After Dinner Mint Shooter: Liquid candy. 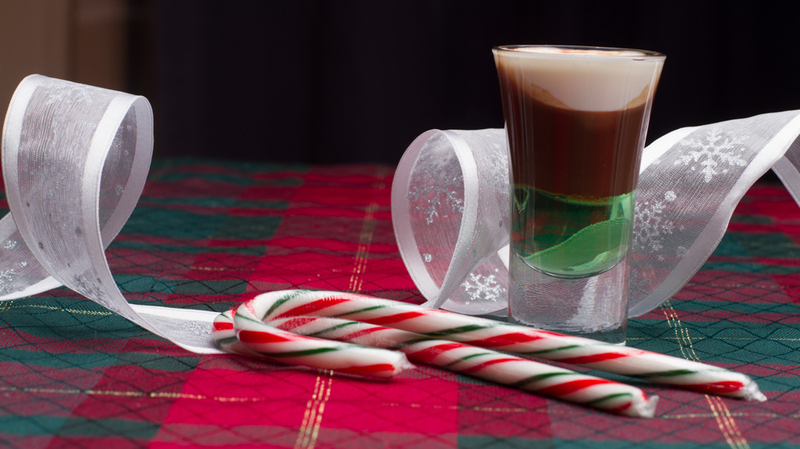 When I was creating layers shooters with the Christmas Holidays in mind, my husband requested I come up with something reminiscent of an after dinner mint. In researching what was commonly done for this, because this has been done before with liqueurs, I found that the common ingredients were layers of chocolate liqueurs (either white creme de cacao, swiss chocolate almond liqueur, white chocolate liqueur), creme de menthe and baileys irish cream. One recipe suggested omitting the chocolate for a second layer of coffee liqueur called Tia Maria. Knowing my audience, a stronger chocolate component was called for. Something truer to the original dinner mint. I had three options: cacao nib syrup (made with unsweetened cacao nibs), chocolate syrup (made with cocoa cocoa powder), and drinking chocolate (made with semi sweet chocolate) . Which would be closest to the true flavour of the chocolate candy? First up: Cacao Nib Syrup. Our thoughts… the Cacao Nib lend a chocolate taste, but also a bit acidic. Not the right fit for this drink. Next: chocolate syrup. Too strong! Lastly: Drinking chocolate. Just right. This is our favourite of the bunch we tested. Layer the drinks in the order above, starting with the mint and ending with the cream. Serve. This was made for my hubby. What did he think. “Just what it should taste like” were his exact words. Seems I got it right. The kids loved it and I think that the more subtle flavour of the chocolate matched the sweet and light flavour of the mint syrup. Simple Syrup: a key ingredient. As I work my way through recipes for drinks, both common and unusual, simple syrups keep showing up as a key ingredient. Simple syrups, like alcoholic infusions, can be flavoured with herbs, spices or fruit and add sweetness and flavour to cocktails, lemonades, iced teas, coffees, fizzes and sodas. When I started working to create virgin drinks with similar tastes to the original alcoholic drinks, I found that simple syrups were a way of creating flavours that imitated some of the sweeter liqueurs like cinnamon and peppermint schnapps, Curaçao, and even Kahlua. Unlike their originals, these syrups lack the bite or kick that the alcohol provides, and will be sweeter. This means that in order to adapt recipes less syrup should be used or the drink will become simply too sweet for most palates. In my testings and trials of drink making I have found that adding bitters, soda water or more sour beverages can counteract the sweetness of the simple syrup. The key, though, is to make the flavouring in the simple syrup strong enough that the amount needed is halved in comparison to a liqueur, without loosing flavour. 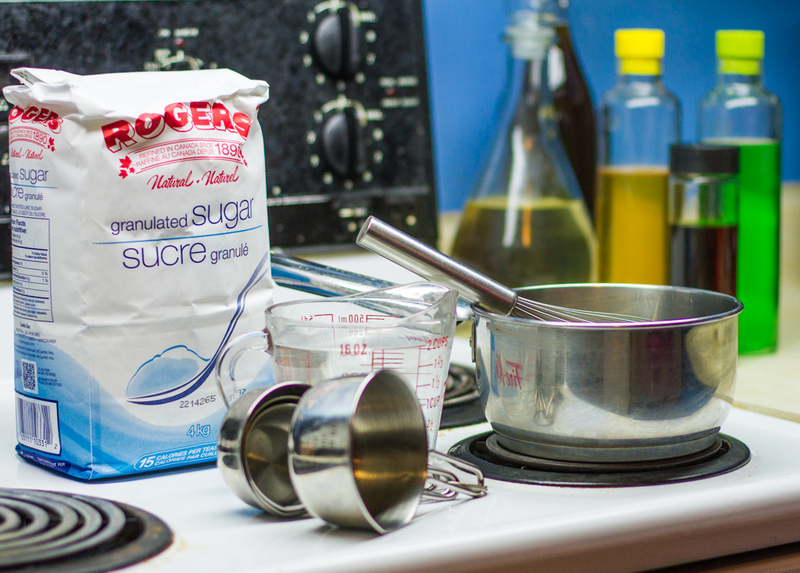 Measure water and sugar into a pot and heat at medium high. Stir occasionally until all the sugar is dissolved in the water and the water turns clear. Turn off heat and allow syrup to cool. Store in container, well sealed, in cool location. Simple syrup recipes are easy to find online. The basics are that the more sugar the stronger the syrup but the components are the same: Sugar and water. Some call a one to one ratio thick or rich simple syrup as does What’s Cooking America others refer to a rich simple syrup as a stronger sugar concentration While Allrecipes suggests that a 1:1 ratio is known as simple syrup. . About Food suggests a rich simple syrup is 2:1 ratio. Whatever it’s called there is four common ratios. 1:1 sugar to water; 2:1 sugar to water; and 1:2 sugar to water; and 1:3 sugar to water. I find that the stronger syrups are better for more sour or bitter combinations such as dark or semi sweet chocolate, coffee, lemons, grapefruit and raspberries. More dilute syrups work best for drinks where multiple syrups and strong juices will be used without diluting the drink with soda water or use of bitters. Simple syrups can also be made with flavoured or alternate sugar sources. Brown sugar makes a pleasant and darker tasting simple syrup, and caramelizing white sugar then introducing the water changes the flavour of the syrup to introduce darker flavours into your drinks. I provided the recipe for carmel syrup in my post all about apples here as it takes a few more steps and some practice to get right. You can also find how I make my coffee syrup which I use at half strength instead of kahlua from my previous post used in my version of Carmel Apple-Disiac, and my cinnamon heavy syrup recipe here as part of my recipe for apple pie shooters. This is a wonderful bright tasting syrup that is infused with the essences of orange zest. The resulting syrup is clear and slightly orange in colour. Heat water in pot on medium high and add orange zest, bring to boil for 2 minutes. Remove from heat and allow to steep half hour. Return to medium high heat and add sugar. Bring back to a low boil and cook until sugar is dissolved and no crystals are left on the bottom. Remove from heat, cool and pour into container for storage. Leave rinds in place to continue to infuse. Store in fridge until use and strain rinds as used. Heat water to boil in pot and add peppermint leaves – allow to simmer 5 minutes then turn off heat and allow to steep up to 1 hour. Strain leaves from water, keeping the infused liquid, and return peppermint water to medium high heat. Add sugar and dissolve sugar. Remove from heat and taste liquid for strength. If liquid feels too weak, add more peppermint leaves and allow to infuse for a few days in the syrup. If desired add a drop or two of green food colouring. 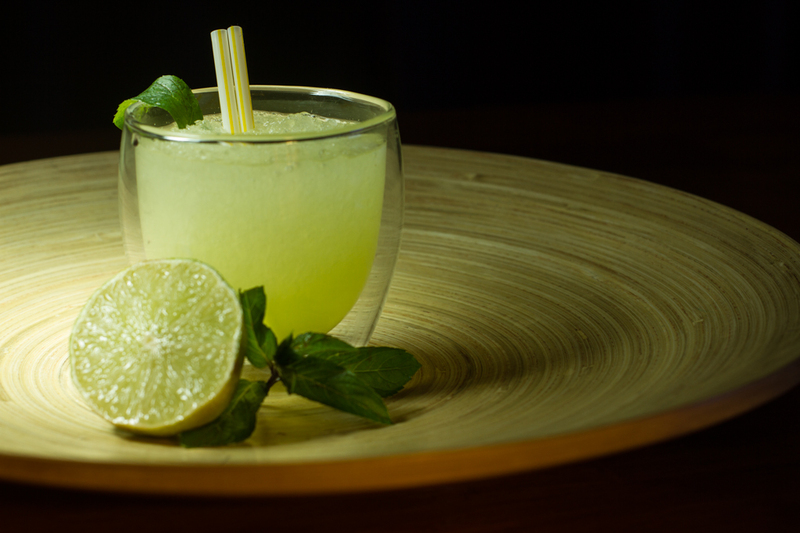 I didn’t have a fresh source of peppermint leaves when I first created this recipe. In order to “cheat” I simply added a few drops of real peppermint extract. 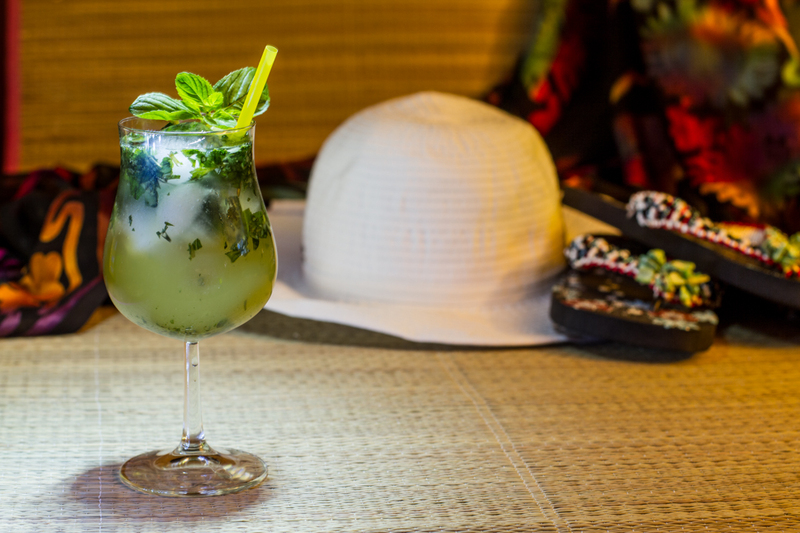 Careful to taste the recipe as you add more mint – peppermint is very strong and you can end up with toothpaste floured syrup instead of something wonderful for drink making purposes. Depending on how often you make a certain drink, or use a flavoured syrup it may be better for you to have the basic recipe for sweetness and add flavour other ways. In many cases I have chosen to make a simple syrup and add flavourings by muddling them into the drink instead of infusing the ingredients into a number of syrups and then storing these for later use. Storing multiple simple syrups can take up space and be expensive if you choose to procure fancy bottles for your liquids to reside. I keep some of my most used syrups on hand – in fancy bottles- cause it looks much cooler when mixing drinks then pulling out multiple plastic Ziplock tubs or old pickle jars. But the majority of my syrups are stored in the cheapest containers I can find and reside in an old fridge in the basement for when I need them.